On World Autism Day, Vocational Rehabilitation shares the story of a young man with Asperger’s syndrome who refused to let his disability keep him from achieving his goals. 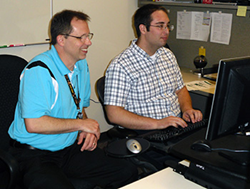 Joseph Show (right) works alongside his supervisor, Ed Mills (left). Joseph didn't let the doctors’ diagnosis of Asperger’s syndrome, which is on the autism spectrum, slow him down. Though he has difficulty understanding boundaries and faces issues with short-term memory, Joseph was determined to go to college. He went to Vocational Rehabilitation (VR), a state agency that helps people with disabilities get or keep a job, for help achieving his goal. He first met with VR Counselor Lynn Picolo to create a career plan. The two decided that Joseph would pursue a bachelor’s degree in informational technology at Florida State University. After several years of hard work, he graduated with honors, becoming the first person in his family to earn a college degree. It took him 18 months after graduation to find just the right job, but now he’s happily working for Keith Rowe at Cornerstone Software Services. He is a software developer, responsible for several mission-critical websites at the Department of Health. “Four days a week I work at the Department of Health under the company’s contract, and one day a week I work with Keith to train on whatever else I need to know so I can do the job better,” says Joseph.